You can find may short vowel games, books, activities, and educational toys in the online store section of this website, but for some quick fun, I've made this simple vowel game which uses worksheets you can find in my short vowel lessons. It's called "Web Words" and there are multiple options for single player games and multiplayer games too. 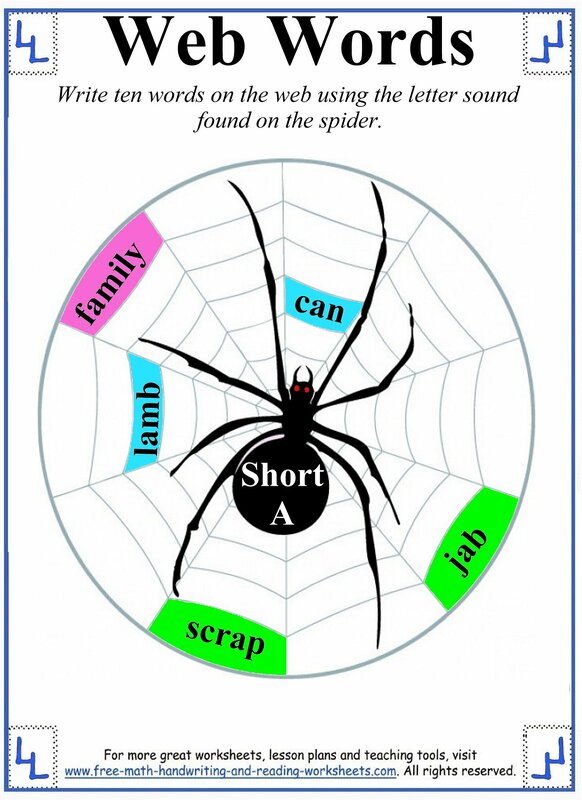 It is a basic writing activity and could be used as part of a lesson on short vowel sounds or sent home as additional homework or practice for students. I have also included a blank template that could be used for other lessons. 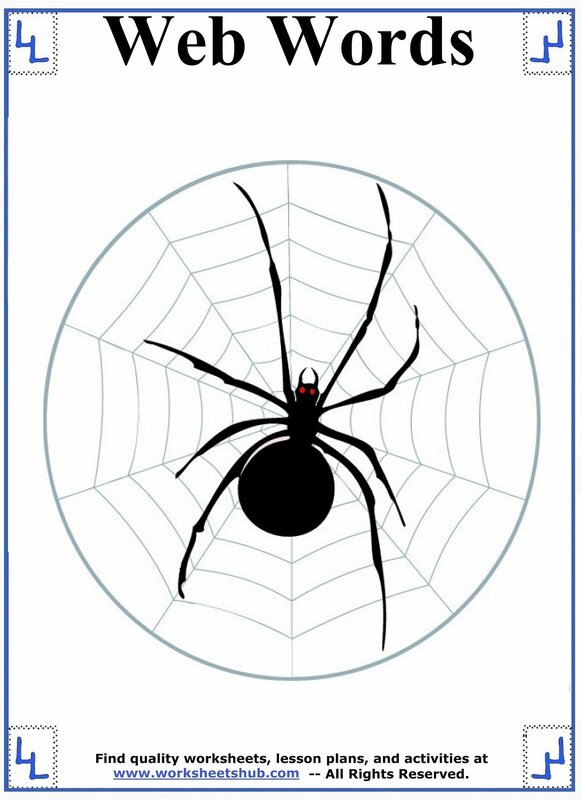 It could also make a fun activity for a spooky Halloween-themed spelling list or let your students color in the web during a class party. To get started, you need to print out one of the five worksheets below. Each one of them focuses on a different short vowel sound. The vowel sound is written on the spider. There are a couple different ways that you can play. I will cover each one of them below and then you can adapt them to your needs either at home or in the classroom. 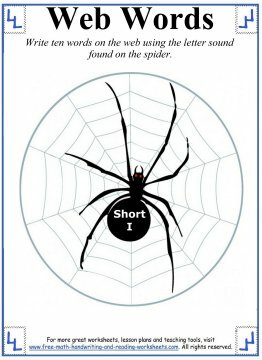 Single player games can be played by writing down words on the web that use the short vowel sound found on the spider. The player scores one point for each letter so 3-letter words are worth 3 points and so on. If the player writes a word that uses the long vowel form (say 'ape' on the short 'a' game board) then he or she loses one point for that word. Played alone, the student tries to see how many points he or she can score. When all of the blank spaces are filled in or the student can't come up with any more words, tally up the score and write it at the top of the page. Two players can play this game as well in a head to head format. Print a separate paper for each player. Set a timer for one or two minutes (or whatever time works best for your grade level) and when the timer goes off, tally up the points that each child had. High-score wins. Two or more players can play using the same game board. 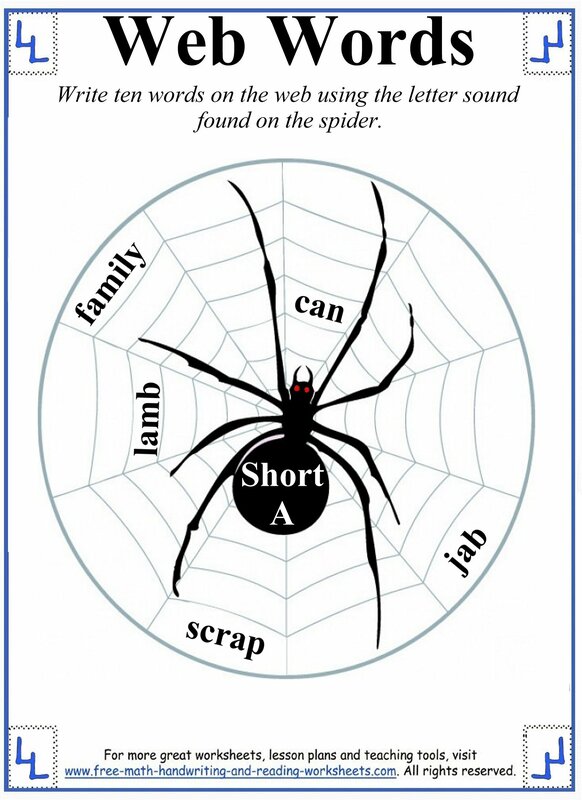 Players take turn writing words using the short vowel sounds as written on the spider. You can have each player pick a different color crayon or marker to keep track of their score. The first player writes a word using their color crayon/marker and then play moves onto the next player. We have also played where we use the same pencil to write our words and then color in the web with our crayons. Find what works best for your child. The second player has ten seconds (or whatever amount of time you determine) to write a word. If a player cannot come up with a word within the time-frame, that player loses a turn. If a player writes a word that uses the long vowel sound instead of the short, that word is colored in black and the player does not get a point. Player one is pink. He wrote "family" and then colored it in. Player two is green. She wrote "scrap" and colored it green. Player three wrote "can" and colored it blue. Pink couldn't come up with a word on his next turn so play passed on to green who wrote "jab". Player three followed up with "lamb" and now it's pink's turn again. There are five printable vowel games--one for each of the vowels. Click to print.